Authentic, to the smallest detail. Fire Replicas are department specific. We start from scratch on every project to ensure authenticity. Our goal with each release is to improve in every area...so that our customers will notice something new each time they view the model. Production of Rescue Engine 33 is limited to 250 units. Fire Replicas are designed with the elite collector in mind, and manufactured in limited quantities to enhance future value. 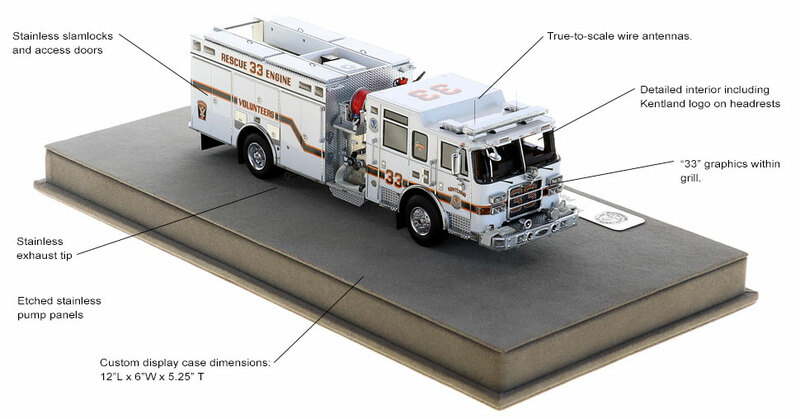 Rescue Engine 33 measures 8"L x 2.5"W x 2.5"T and is securely displayed inside a custom case. The case dimensions are 12"L x 6"W x 5.25"T and the platform includes an etched stainless steel nameplate with the Kentland seal, department and truck name. This Kentland Volunteer Fire Department Rescue Engine 33 scale model is a museum grade replica. Like all Fire Replicas models, every detail is modeled to perfection and with razor sharp precision. The replica features the specific department configuration and graphics, leaving no detail overlooked. The display case is custom manufactured with high quality acrylic and resin. The stainless steel etched plate features the department and truck name, and department seal. This replica is a treasure to be displayed and admired and is in no way a toy. Everything about this piece is perfect. Great work looks just like the real thing. Great job. Received my Kentland rescue engine 33 and Fire Replicas has once again produced the highest quality fire apparatus replica in 1/50 scale. The attention to detail is outstanding, the likeness of the model to the real truck is just an incredible duplication. The Pierce Arrow XT cab is an exact replication with razor sharp detail's from the nose of the truck with the headlights & front bumper/grill to the roof line and perimeter cab doors. Following through to the pump panel with 100% accuracy & body that is just unbelievable replication. Fire Replica continues to produce 100% likeness fire apparatus scale museum grade replica's. Thank you Fire Replicas for such incredible models look forward to many more coming down the production line. 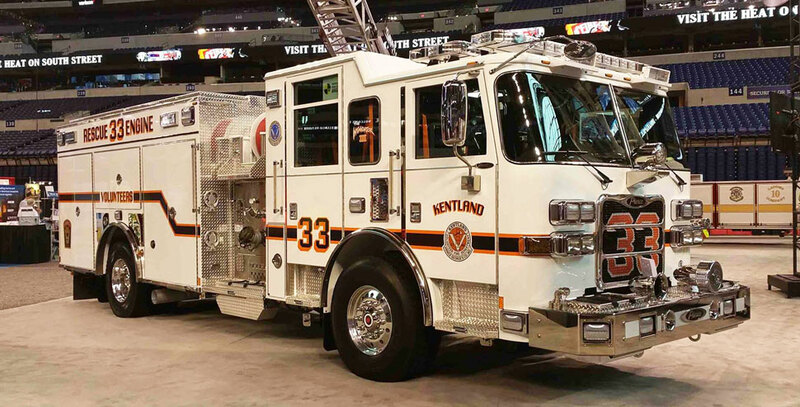 The Kentland VFD Rescue Engine 33 is just another fine example of your company's willingness to produce an amazing and accurate replica of the real rig! Your attention to detail is spot on. Keep up the great work!! Thank you, Pat L.
From the time you unbox this model you can see and feel the quality. Having seen the actual truck in person, I can’t say enough about the detail and accuracy of the model. Fire Replicas have once again knock it out of the park. I was lucky enough to spend some time reviewing every millimeter of the new Fire Replicas Pierce Kentland Rescue Engine 33. Kentland is a popular department and Pierce has many fanatics - there will be no disappointments with this model from them or anyone else that is smart enough to purchase this model. 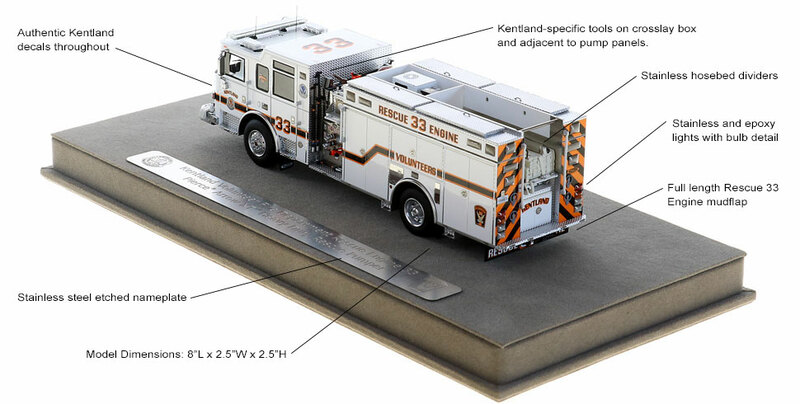 Put this model next to the previously released Seagrave Kentland Tower 33 and you have a great set. Fire Replicas has done a fantastic job of recreating Kentland's 2016 Pierce Arrow XT Heavy Duty Rescue Pumper. The fit and finish are perfect and the Kentland markings look fantastic on the white paint. Fire Replicas has done an outstanding job of recreating the grill with the 33 emblazoned on the radiator grill. The front bumper is a sight to see with a pair of sirens (including a beautiful Federal Q), a pair of hoses and accurate Pierce nameplate. The pump panel is authentic, as is the hose reel and monitor. I cannot say enough about the beautiful cabinet door hinges and slam locks. The use of stainless steel etch is well executed and the detail and accuracy is further enhanced by the wealth of tools included. How in the heck they can build these 500+ piece models is beyond me! The headlights, scene lighting and emergency lighting are composed of multiple layers to enhance accuracy. Bottom line: another unbelievable model. Fire model collectors sure are fortunate to have Fire Replicas! The models are well worth the price. Simply amazing! Sign me up for a pair of these beauties!